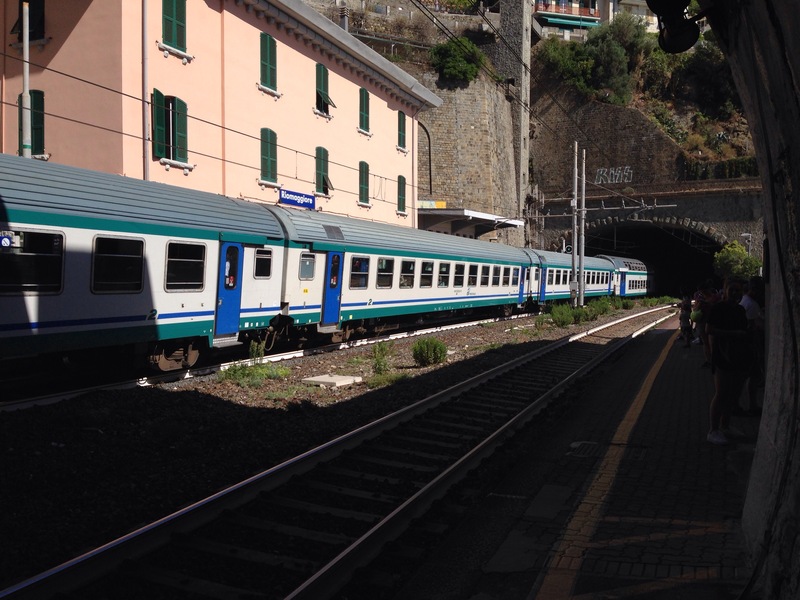 Did you know that if you board a regional train without validating your ticket in one of the machines at the station that you face up to a €200 fine? Ouch. If you pay the fine immediately on board to the controller the fine drops to €50 per person, but that’s still a very pricey lesson learned. 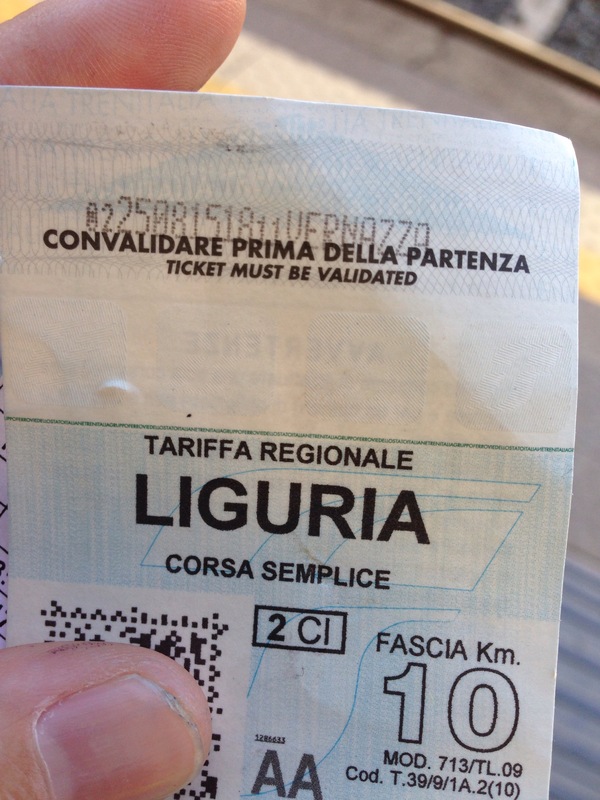 A lot of people visiting Italy don’t realize that the tickets you buy for the slower trains are basically good forever. 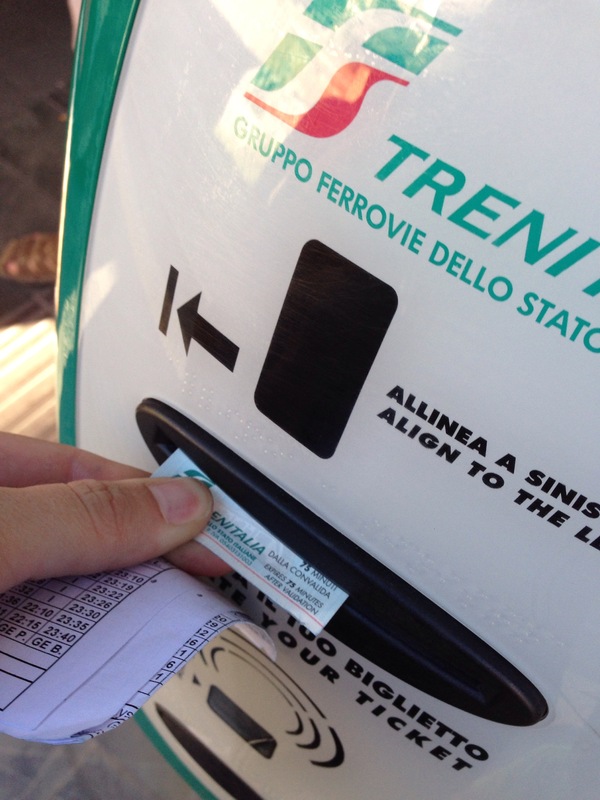 Only by validating them in one of those nifty boxes at the train station does your ticket become valid for a certain number of minutes (or hours, the quantity of time varies from region to region) from the time stamp. 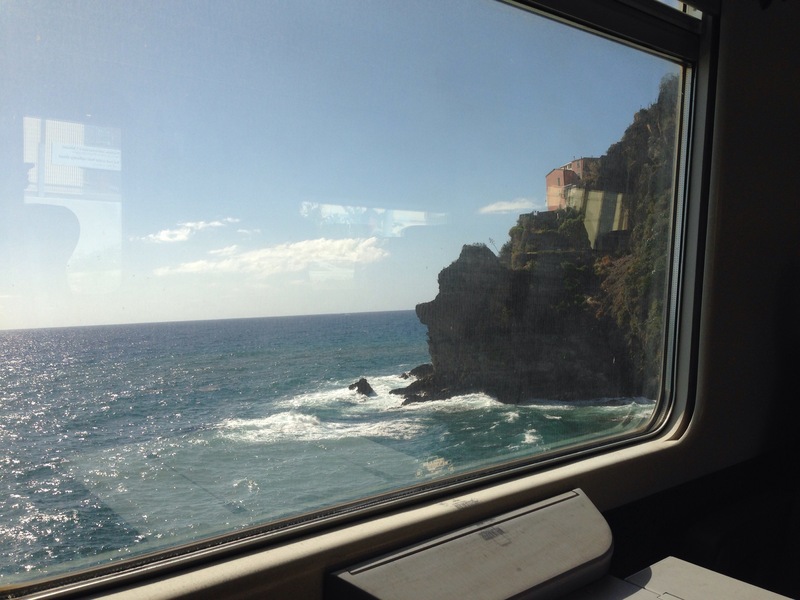 Hence the reason for the hefty fine, as potentially a traveler could use the same ticket for an unlimited number of trips if they never validated it! 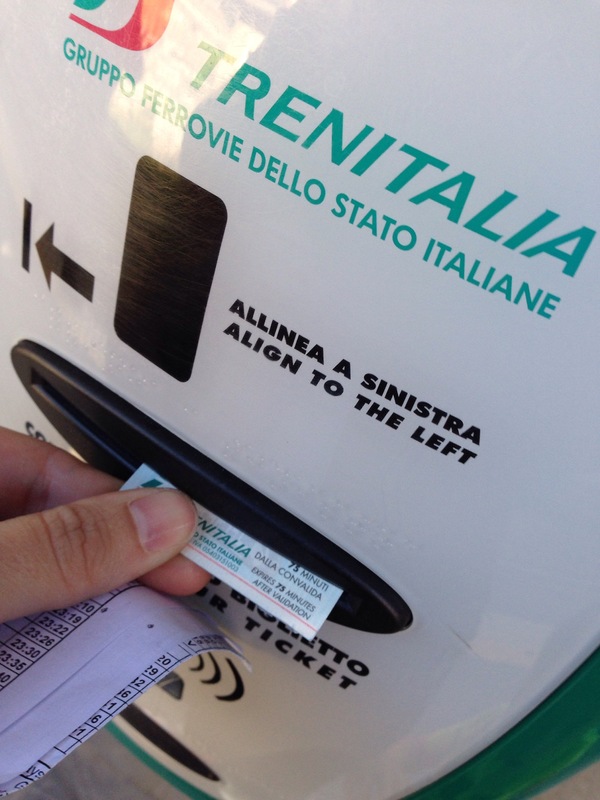 I know the concept of validating a ticket is strange to those not from Italy (in most other countries when you buy a ticket it’s only good for that specific train so there’s no need to validate), so it’s actually a pretty common occurence for visitors to board the regional trains without first validating their tickets. Unfortunately, it’s also a common occurrence for these visitors to be fined once they are on the train. Here’s a step-by-step guide for what you need to do to validate your ticket (it’s easy peasy, but I find that visuals always help with these sorts of things). You should see a green light on the validating machine, which means it’s working properly. If you see a red light the machine is out of order and you’ll need to find another one. Sometimes you’ll hear the sound of the machine validating your ticket but when you pull it out you won’t see anything printed on your ticket (which means the machine has run out of ink). In this case, find another machine and try validating again. If all of the validating machines are out of order (not a common occurence but it can happen), go ahead and board the train but immediately look to find the controller (it’s actually easiest to spot them outside of the train at the stop, as they wait to make sure everyone is on board before getting back on the train themselves). 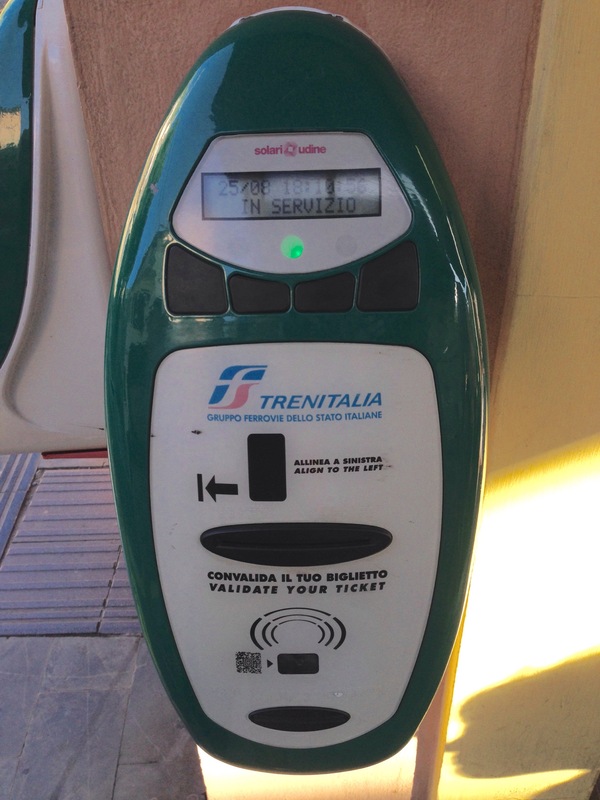 Once you’ve found the controller, explain that the machines weren’t working (“Le macchinette sono guaste!”) so that they can manually validate your ticket for you. BEWARE: If you don’t actively seek out the controller and they find you (instead of vice versa) chances are they are going to fine you anyway (as they’ve heard the excuse a million times, kind of like teachers hearing that a dog ate a student’s homework). Lastly, I hate that I have to say this but I feel it’s my duty… If you are fined for not having validated your ticket and you pay the controller be sure to receive some sort of receipt in return (showing proof of the amount paid, etc.). Also, according to the official TrenItalia website, you should pay no more than a €50 fine per person if you pay the controller immediately. If the controller takes more than that amount per person, something is very, very fishy (chances are part of the fine is being pocketed). In the event that that happens, get details so you can report them accordingly.